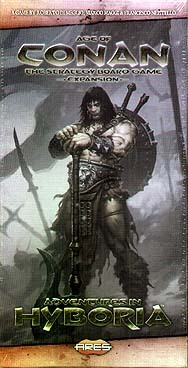 It's the Age of Conan... By Crom! Will Conan be on your side, or against you? Adventurers in Hyboria is the first expansion for the Age of Strategy board game, and is designed to enhance the role of Conan in the game with the combined interplay of Story Cards, Adventure Cards and a new board used to track the growth of Conan from warrior to king. Adventures in Hyboria also provides exciting new additions to the game - Spies and Prisoners - to give more weapons and reasons to the rulers of the most powerful kingdoms of Hyboria to fight each other. This expansion includes 25 high quality plastic figures - with spies for each kingdom and three new Conan figures; more than 100 cards; three new engraved special Conan dice; prisoner and adventure tokens; and a 20" x 6" Conan Refernce Board. This is not a complete game. A copy of Age of Conan is require to play.